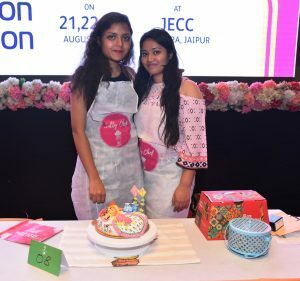 The Salt Food Festival gave Jaipurites the chance to participate in a one-of-its-kind cake craft competition at JECC, Sitapura. 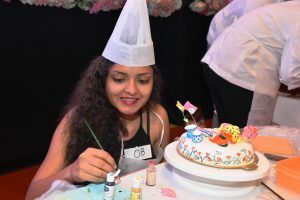 In the event, 12 teams of two students crafted fascinating cakes on the theme ‘Pink City’. Most of the students were from a culinary background and belonged to different colleges of the city. 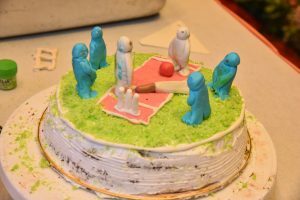 The participants decorated cake sponges using various edible elements like fondants, hand whipped cream, among others. To showcase Jaipur on their cakes, the students decorated the cake with designs of turbans, moustache, bandhej chunni, among others. 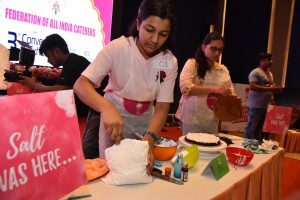 The judges of the competition were pastry chef Ms. Eureka Araujo, food entrepreneur, Ms. Ketki Barfiwala and food blogger, Ms. Radhika Agarwal. The cakes in the competition were judged on the basis of creativity, technique and neatness were the main parameters on which the participants were judged. This competition was held in association with Salt Food Festival which will be held in the Pink City on 20 and 21 October. The winners for the competition were – Ayushi Agarwal and Prachi Modi from Manipal University.